A4 Size 7.3 x 9.6 in. (186 x 244 mm) 8.3 x 11.7 in. A4 Mounted 7.3 x 9.6 in. (186 x 244 mm) 11 x 14 in. (272 x 358 mm) 11.7 x 16.5 in. SMALL 10 x 13.2 in. (254 x 335 mm) 12 x 16.5 in. MEDIUM 15 x 19.75 in. (381 x 502 mm) 18.5 x 24 in. 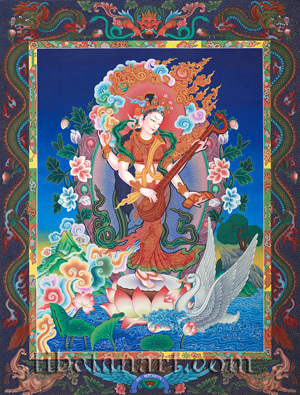 Sarasvati, the four-armed wisdom goddess, is the consort of Manjushri or Manjukumara, the 'Sweet-voiced youth'. She appears here in her standing form as Vajra-vina Sarasvati, who is known in Tibetan as the 'Goddess of melodious speech', and in her praises as the 'Immaculate Swan-child'. The Sarasvati was once a great Indian river that dried up many thousands of years ago, but its invisible or hidden presence has always been equated with the refined 'central channel' of the subtle body, with the two other main river-goddesses of ancient India, the Ganga and Yamuna' representing the subtle body's 'lunar and solar channels'. Sarasvati, as a deified river-goddess, is mentioned many times in the Rig Veda, the earliest of the Four Vedas, and the ancient civilization that once populated her riverbanks may later have migrated to the Indus Valley when this great mythical river finally dried up. Sarasvati stands gracefully upon a silver moon disc and a pink lotus that rises above the turbulent waters of a lotus-lake. Her white swan vehicle glides gracefully in front of her, with its intricately feathered wings extended and the stem of a pink lotus held in its beak. Sarasvati is beautiful and radiantly white in colour, and her youthful form is adorned with the five silk garments and eight jeweled ornaments of a sambhoghakaya goddess. With her first pair of right and left hands she plays upon the strings of her sitar-like Sarasvati-vina, the fretted neck of which is crowned with the carved head of a swan. With her second right hand she holds aloft a golden rosary, and with her second left hand she holds the bound pages of a sacred text. She has a sweetly smiling face with two compassionate eyes, and the long strands of her blue-black hair flow freely behind her back. The dark indigo outline around Sarasvati's body and billowing garments causes her form to stand out against her blue inner aura, while a canopy of lotus flowers and leaves surrounds the intricate scrolls of her outer aura. Her red halo is encircled by colourful clouds and flame-like scrolling crests, and the clarity of her form is enhanced by the vibrant electric-blue of the sky. The dense lower landscape contains drifting multicoloured clouds, mountains, rocks, a solitary tree, and lotus flowers with large convoluted leaves. The inner torana of the painting is decorated with colourful brocade designs: while the dark outer torana is speckled with golden dots and ornamented with the crowning serpent-devouring head of kirtimukha, two jewel-grasping dragons, two makaras, and the winged emblem of garuda at the bottom centre. This painting was made by the Newar artist Kiran Joshi, and is based upon an early composition by Uday Charan Shrestha.